True Love—It Does Deserve a Celebration! A term most widely and loosely used in this day and age is ‘Love’ perhaps. We throw it freely on everyone, and profess love through heart smileys and emoticons generously for every trivial thing—at times, even to thank someone for a work! Kisses, hearts, lovey- dovey smileys, bear hug emoticons sent randomly to one and all on our contact lists do stand for love and friendship but they do not necessarily vouch for it. Well, true love doesn’t vouch for durability either but it does vouch to remain sincere till the end, to stay on a little while longer and understand the beloved beyond rationality, habit and heartbreaks. It is heartening to know that despite this world of fakeness and artificial and antiseptic reality, true love does exist and perhaps that is why people all over the world celebrate this day so passionately, painting their towns red as they say! While love bloom in the hearts and floats in the air on this special day, here’s a quick BTW peek into a few countries of the world and Bahrain on how this day is celebrated. Although Valentine’s Day is a relatively new holiday in Denmark (celebrated since the early 1990s according to the Ministry of Foreign Affairs of Denmark), the country has embraced February 14th with a Danish twist. Rather than roses, friends and sweethearts exchange pressed white flowers called snowdrops. It’s been said that the first Valentine’s Day card originated in France when Charles, Duke of Orleans, sent love letters to his wife while imprisoned in the Tower of London in 1415. Today, Valentine’s Day cards remain a popular tradition in France and around the world. Another traditional Valentine’s Day event in France was the loterie d’amour, or “drawing for love.” Men and women would fill houses that faced one another, and then take turns calling out to one another and pairing off. Men who weren’t satisfied with their match could simply leave a woman for another, and the women left unmatched gathered afterward for a bonfire. Valentine’s Day is a popular holiday for young couples in South Korea, and variations of the holiday are celebrated monthly from February through April. The gift-giving starts on February 14th, when it’s up to women to woo their men with chocolates, candies and flowers. The tables turn on March 14th, a holiday known as White Day, when men not only shower their sweethearts with chocolates and flowers, but up the ante with a gift. And for those who don’t have much to celebrate on either Valentine’s Day or White Day, there is a third holiday: Black Day. On April 14th, it’s customary for singles to mourn their solitary status by eating dark bowls of jajangmyeon, or black bean-paste noodles. You won’t find the Welsh celebrating Saint Valentine — instead, people in Wales celebrate Saint Dwynwen, the Welsh patron saint of lovers, on January 25th. One traditional romantic Welsh gift is a love spoon. As early as the 17th century, Welsh men carved intricate wooden spoons as a token of affection for the women they loved. Patterns and symbols were carved into these love spoons, each signifying a different meaning. A few examples include horseshoes, which stand for good luck; wheels, which symbolize support; and keys, which symbolize the keys to a man’s heart. Celebrate Valentine’s Day at Golestan Iranian Restaurant and Soie Chinese Restaurant. A special set menu will be offered at BD 14.900++ and BD 19.900++ per person. Ladies get roses and heart shape cookies. Book online at www.soiebahrain.com or www.golestanbahrain.com . Enjoy a Luxury Moonlit Romance augmented with Rose petals, candles, private butlers, a lavish feast and an entire beach at your beck and call-prepare for a sea of emotions. Book your private tent on the beach and enjoy a dinner under the stars along with a magical selection of perks and treats. BD 199.00 + 10% government levy per couple. Club it up with a Couples Retreat spa package and immortalize your love! 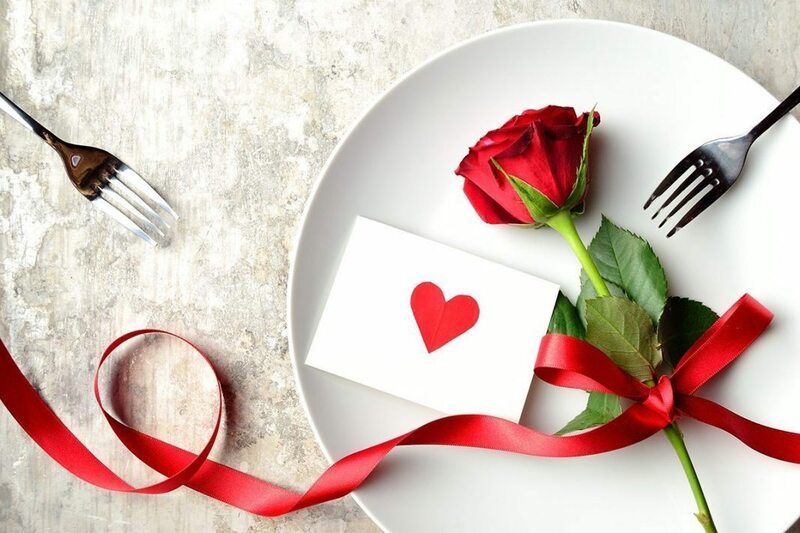 This Valentine’s day, romance will be at the meeting point at the Diplomat Radisson Blu Hotel, Residence & Spa, offering exceptional surprises with extravagant dining experiences while showing that special someone how much you care. Start your day with the Romantic Brunch at 28BD net per person, gathering family and friends in the lovely and warm atmosphere of the Kontiki Restaurant & Kontiki Pool bar. The Black Notes Band will perform to you all, with a hint of romantic Latino entertainment. Then Romance the night away with divine five-course specially created menu at Mondo Restaurant, to make this day exceptional as your beloved one is. Looking for something very exceptional? Treat your loved one to an unforgettable weekend with our overnight lovely package starting at BD121, offering you one night in one of our Valentine themed Standard room and access to our Romantic Brunch. Close your eyes and imagine… An inspiring view on the sea glitters of the beneficent stars in the sky, warmth of torches and candles surrounding you, intimacy of a beach. Who would not wish to treat their life partner with such a beautiful setting? Benefiting from one of the only few beach in Bahrain, with an incredible view over the city light of Juffair, the Novotel Bahrain Al Dana Resort opens the privacy of its seafront to only 20 lucky couples for dinner. Your table set in the middle of candles and torches and granted additional privacy behind a pure white veil, you will be offered a luscious international buffet with an unforgettable guitar accompanied menu. And last but not the least, if you are a Vapiano guest, then you end the Valentine’s experience with a memorable evening with Ahmed Sharif who shares with you his valuable experiences over some great food. So surrender to the spirit of the day, to the call of the heart and enjoy a memorable Valentine’s Day dear reader!